Charleston’s History dates back to 1663 with its beginnings based on the export of rice, cotton and Indigo which made the city a bustling trade center and the wealthiest and largest city South of Philadelphia by the time of the American Revolutionary War . 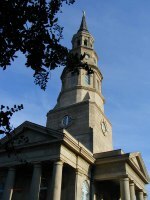 In the post-revolutionary war Plantation or Antebellum Era , Charleston became a prosperous city. 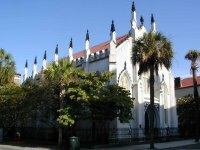 Charleston's most famed structures date from the 18th and 19th Centuries and are in the area known as "South of Broad", or South of Broad Street and include Rainbow Row and Battery Row. Common architectural styles found are: Georgian , Federal , Greek Revival , Italianate and Queen Anne . 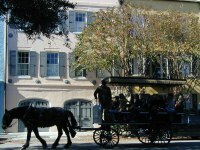 Two typical types of homes in Charleston are the Charleston Single House and the Charleston Double House. The Single House is identified by long verandas or porches that run the length of the structure and serve as exterior spaces or hallways, it is typically between 10 to 25 feet wide with the length of the house perpendicular to the street. The house sits asymmetrically along one side of the lot line with the rest of the lot on the side of the porch or veranda used as a single side yard. The interiors of Charleston single houses are usually one room wide and several rooms long. 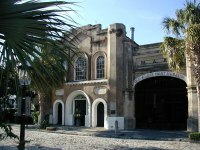 The Charleston Double House face full length to the street and is characterized by a central hallway running through the house with four rooms on each floor, two in the front and two in the back with living areas assigned to the first floor and bedrooms on the second. As with the Single House, it too has covered porches or verandas running along the length of the house. 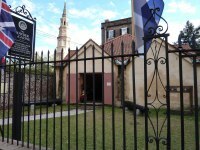 The second gallery below include pictures of sites in the Charleston area not necessarilly representatives of the local architecture, however, include some sites of interest relating to the American Revolutionary and Civil Wars.